The planet harbouring us is always turning, awaiting its critical mass, one which will lead to the development of a world, might better but it can be worse. For the time being, the universal society will keep on drowning in its own blood, regrets, sins and disbeliefs. The constant fight to supress the depression, worsening state of affairs, these are hardships that no one would have dreamed to bear, but one day it will all end, after our time will run out and only the memory will remain. So how about a new world chaos, something to deep sink teeth in and not just to pass the time with? Sorrow, fury, pain and melancholy, are the sacred weapons. Therefore I found NAILGUN, a German Metal band fixated on the how much time we don’t have to pack up our memories and leave this world to face its own fate. Free styling on their own, without a label attached, NAILGUN, recently, issued their sophomore album, “New World Chaos”, dipped with bitter mourning, underneath the shroud of blackness. Don’t be alarmed, this won’t hurt a bit. Listening to particular bands like NAILGUN here, helped me come into the notion that tags are just tags, and not an absolute factor or too much being obvious about it. I can always label, but it will never be the exact truth, because solely the artist can attest what he is doing with his music. We, listeners and spectators, can only determine by our own set of standards. But what the heck? I always like to keep my feet wet or blemished with mud. It is said that NAILGUN tread through Heavy and Thrash Metal. That they do, and it can be definitely perceived, yet there is more to it than that. With METALLICA being the centrepiece of an influence for this entire release, the Germans seemed to be saturating in the melodic aureoles of ICED EARTH and IMAGIKA riffing, shimmering with a few US Power Metal, caressed by lament and desolation of PARADISE LOST throbbing with the Doomish refinements of “Icon” and “Draconian Times” (take out the Gothic attributes) and with a few darkened METALLICA’s thrashy / groove spawning like early PERZONAL WAR and early AM I BLOOD. I may be right or wrong, but “New World Chaos” generated perplexed feelings and quite an interesting set of perspectives, yet one thing seemed certain to ascertain, the end might be nearer than what we would like to think. I believe that “New World Chaos” can be regarded as quite a pressure point, a special summit for the lost hopes, peak determination and conviction for a grand rude awakening, a slap in the face for the entire world to notice. NAILGUN displayed some of Metal’s archetypal symbols such as proficient harmonic guitaring with that fresh incisiveness, yet also carving on the skin with melancholic styled licks of downright agony that sanctioned murkiness (“I Have Enough” and “Abyss Of Shadows”). These melodies attacked nearly on corner, while also igniting their dominion with splendid soloing insertions crossing between freshness and vintage flavours. Furthermore, there is an amazing foundation of rhythm guitar riffing scouring through various worlds and dimensions, cut throat mid tempo grave Thrash defilements but also distributing catchy choruses, with a few hymns, with proud fists in the air (“Darkest Hour” and “Change of Season”). Finalizing this sniffle story is “You Are Everything”, a ballad touched by romance, quite a glorifying epic of pure greatness, like a requiem right before the very end. 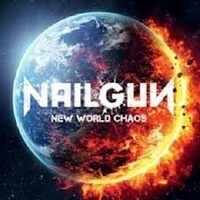 “New World Chaos” lengthened to nearly all angles, brandishing parcels within the Metal genres, expect the extreme zone, a well written melancholic release with plenty to think about.